The best thing about islands is that you can circumnavigate them on a cruise ship, and that is exactly what my husband and I did on the Azamara Journey, a charming ship that carried us for 13 nights around the two islands of New Zealand and in and out of the stunning harbours and quirky little ports that make that country such a popular destination. An added bonus was beginning in Auckland and ending in Sydney, Australia, allowing extended stays in both those terrific cities. For us, the lure of Sydney included a chance to visit family living there. Our first port of call was in the popular playground of the Bay of Islands where we took a tender in to Russell, a delightful town with, as we learned in the tiny museum, a wicked history. It was once a shore station for whalers, full of bars and brothels, and known as the ‘hell-hole of the Pacific’. Today it’s a peaceful place with a historic waterfront hotel, The Duke of Marlborough, where we ate a divine seafood chowder while overlooking the harbour and our ship at anchor on the placid sea. The Azamara Journey is small by today’s mega-ship standards allowing it access to smaller ports like Tauranga in the Bay of Plenty, the sunniest region of the North Island. Originally settled by the Maori in the 13th century, shore options here included heritage discoveries and Maori entertainment. I chose to take a guided hike up Mount Maunganui, a cone-shaped volcanic mountain known simply as the Mount. It was a challenging 90-minute climb in the heat of the southern sun but the view from the top up and down the coastline was spectacular. The reward for our efforts was to have been a soothing soak in the heated saltwater pools at the base of the mountain but, by then, we were all so overheated we chose to head back to the cooler waters of our ship’s swimming pool. The pool deck was a great place to relax on warm days and was the setting for the much anticipated “White Night Party”, an evening of amazing food and entertainment that is a favourite of Azamara guests. We did make good use of the walking track above the pool deck in rain or shine and often followed our morning walk with a stretch class in the bright, airy Living Room. The Living Room also became our go-to place at the end of the day. An incredible hot hors d’oeuvres buffet was presented every evening at five o’clock. We arrived promptly to order a cocktail (all included) and sample the array of delicacies like hot shrimp wrapped in bacon and mini quiches. As we cruised south toward Wellington, the capital of New Zealand, we discovered the reason for the town’s nickname “Windy Welly”. That night, despite the rain and wind, almost every guest disembarked for the AzAmazing Evening Event, a signature treat that is one of the highlights on Azamara cruises. The setting was the Wellington Cathedral of St. Paul, a beautiful Anglican cathedral that had been restored after suffering minor damage in the 2016 earthquake. Champagne and canapés were on offer as we took our seats and settled in to enjoy an ‘amazing’ concert of classical favourites performed by the Wellington Symphony Orchestra. It was certainly an evening to remember. There were many more memorable moments during our cruise around New Zealand. 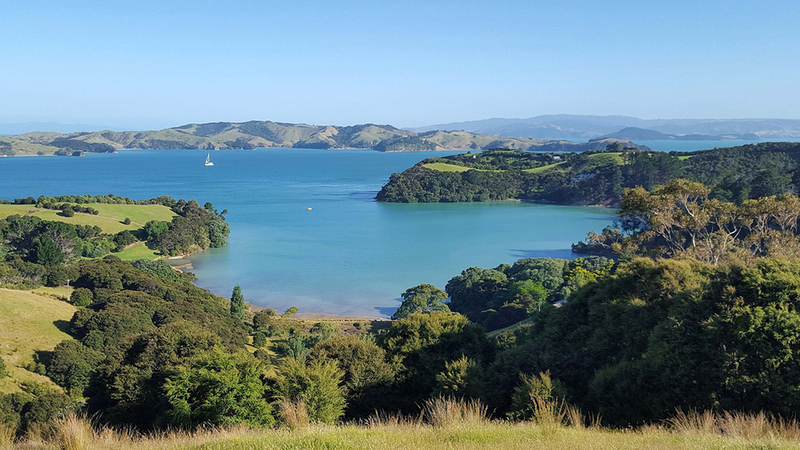 The country’s spectacular natural beauty provided the backdrop for kayaking in Otago harbour, nature walks to see rare and unusual wildlife like tiny blue penguins and the large-winged albatross, and visits to sheep farms and kiwi fruit orchards. One of our most-enjoyed shore excursions was a hike along the Queen Charlotte Track. We had reached the town of Picton in the South Island, gateway to the inlets of Marlborough Sound where the famous sauvignon blanc wines are produced. Many of our fellow guests went to visit the vineyards but we chose to hike a section of their famous hiking trail. Called ‘tramping’ here, not hiking, it is hugely popular with locals and tourists … and Kiwi guides love to point out how safe their bush is compared to the “vermin and snake-riddled trails of Australia”. 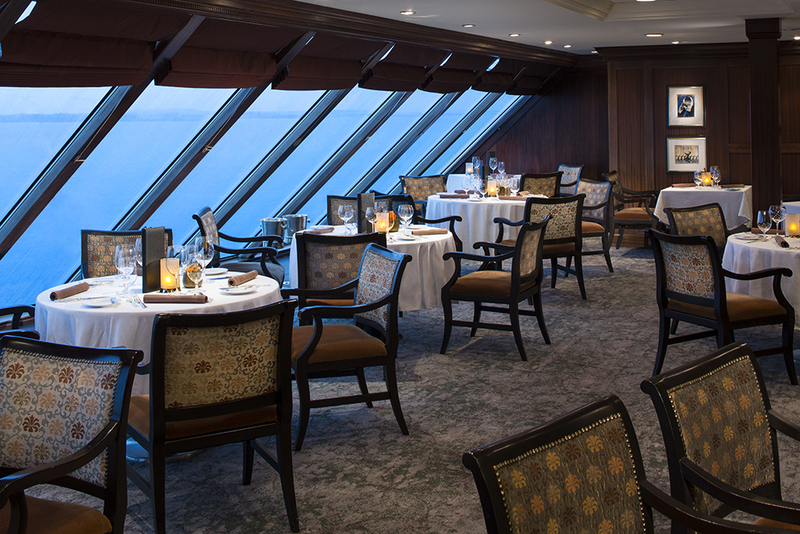 Over the course of the cruise we sampled all the restaurants and remember, in particular, the perfectly grilled chateaubriand carved at our table in Prime C. It was topped with a wonderful béarnaise sauce and served with creamed spinach and steak frites. The menu in both specialty restaurants (Prime C for steaks and Aqualina for Italian food) always included baked soufflés for dessert, a rare treat. After dinner most nights we found our way to the Cabaret for the evening entertainment which always exceeded our expectations. On our final day in New Zealand before crossing the Tasman Sea to Australia we sailed into the famous Milford Sound, a fjord known for towering sea cliffs and plummeting waterfalls. It was a misty rain-jacket afternoon, everything green and gauzy, except the dazzling white of the waterfalls. From the open top deck we watched in awe as our captain slowly navigated the narrow channels, nosing in so close to the falls that we could actually feel the misty spray. After two days at sea we sailed into Sydney Harbour on a lovely pink-sky evening. Approaching the iconic sights – the Opera House with its sail-like design, the arched Harbour bridge, the inlets filled with private sailboats out enjoying the summer weather – provided a perfect finale to an idyllic cruise Down Under. And there to greet us, our two granddaughters waiting at Circular Quay, as we disembarked. IF YOU GO: If you’re in search of the sun, the best months to sail in the waters around New Zealand and Australia are December to February, during their warm summer. For more information visit www.azamaraclubcruises.com and reach out to your preferred travel advisor. Written by Judy Ross for Cruise and Travel Lifestyles (Winter/Spring 2019). 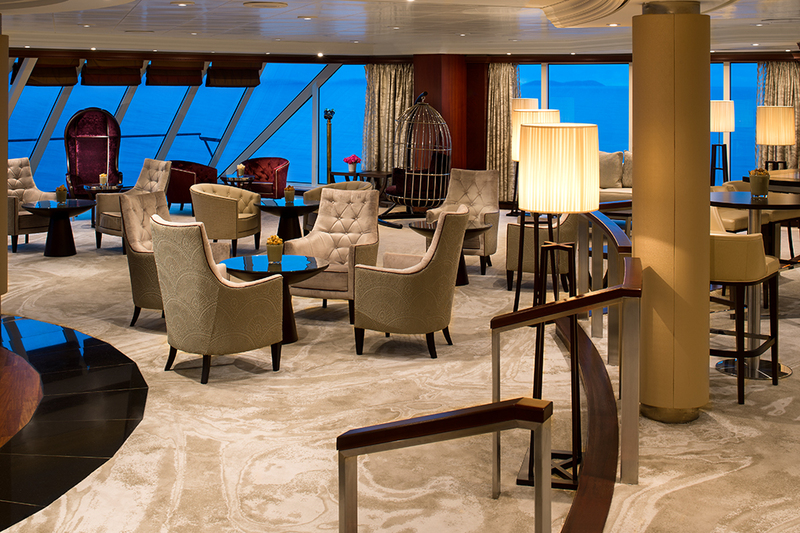 Photos courtesy of Azamara Club Cruises.